We’re well into the beta stage for Weather Battle at this time so I wanted to take this opportunity to write an update. We wrapped an investment round at the end of 2018 and brought on some fabulous minds in the process, both investment-oriented, and staff. The capital to make things happen, along with the people behind that capital supporting this business 110% is something every startup deserves but rarely accomplishes. Our business structure at this time is progressive and highly focused on development and marketing. This structure has helped us make a splash rather quickly from a market penetration standpoint. Jumping in head-first though requires an extremely strong development team, and holy cow do we ever have one of those! It’s necessary to tap top talent for this type of project too as with financial transactions, security is key. UI/UX is secondary. 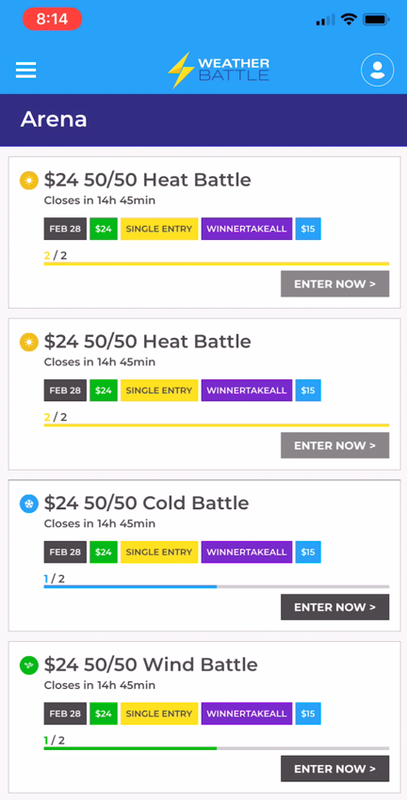 As I write, experimentation with different gameplay options and entry/winning $ amounts is underway. Over the next several weeks you’ll note a lack of consistency in the games offered. We are taking this opportunity to collect metrics surrounding overall interest as game adaptations are tested. This info will be used to determine which games will be created and when, for how much entry $, etc. Next up is the mobile app, which is in final development stages and will be released on the App Store and on Google Play on or around April 1. 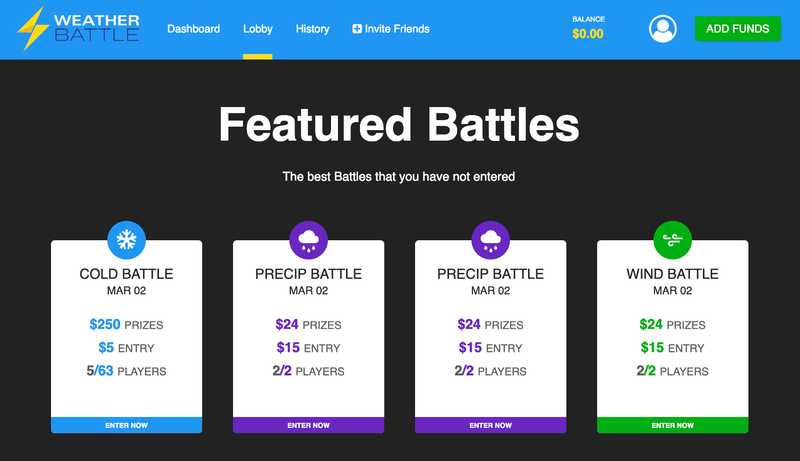 With the launch of live play on the mobile app, Weather Battle will be officially open for business! Money play is happening now during beta so don’t hesitate to sign up, just plan on using your browser to play for the time being. If you’re a current Weather Battle player (new or seasoned), we’d love your feedback about the daily offerings, gameplay, and/or your ideas. Just tap that support email on the site to share your thoughts. We love great feedback! Until the next update, #BattleOn!